For the project “Eye for an Eye”, young Berliners, under the guidance of the Belgian director and actor Ruud Gielens, developed their own solo performances on the topic of “power”. The starting point is the location of the Haus der Kulturen der Welt in the political heart of Berlin. Kanzleramt and Reichstag, centers of democracy, are situated within view of the HKW. 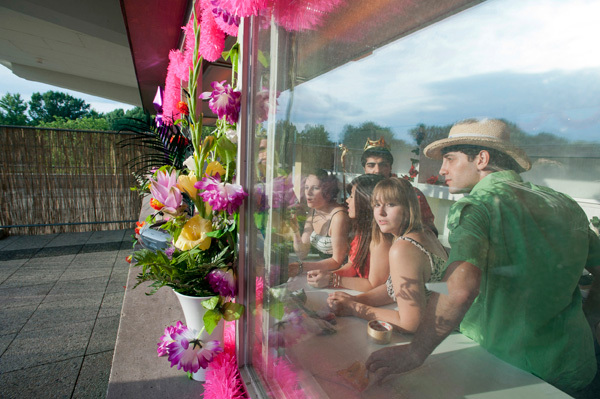 At the end of IN TRANSIT, the young people will present the results of their workshop live: At the HKW's roof terrace kiosk, they will offer up their individual shows for sale. The spectators will then choose which performer they want to see and follow him or her to a secret place elsewhere in the Haus.